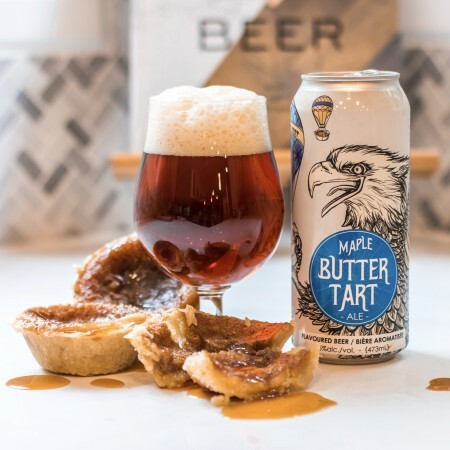 GRAVENHURST, ON – Sawdust City Brewing and has announced that an award-winning and popular beer inspired by the Ontario Butter Tart Festival in Midland has returned for another year. Maple Butter Tart Ale was the winner of Collaboration Nation North, a competition between beers representing different cities and towns in northern Ontario, at the 2015 edition of the Griffin Session Muskoka beer festival. It was later available at select LCBO locations for a limited time, and is now returning for another run. Maple Butter Tart Ale has a deep amber colour with a creamy head. Vivid aromas of maple, butter rum pudding, vanilla, and caramel candy lead the way for notes of pie crust, toffee, molasses and chocolate. This ale boasts a dry, medium bodied, creamy, well-balanced crisp-hoppy bitterness. It then gives way to flavours of maple, toffee and malt, along with subtle notes of fruit, amber rum and butter on a long, enjoyable finish. Maple Butter Tart Ale is available now in 473 ml cans at the Sawdust City retail store and online shop. A wider release at LCBO stores throughout Ontario will follow this autumn.